Bonding wires are used to electrically connect aluminum electrodes (the connection terminals on IC chips such as LSIs and transistors) with lead electrodes for external connections. Bonding wire products are included in most semiconductor devices used on earth. As a result of semiconductor devices becoming smaller, wire diameters are becoming thinner as well. Currently, the diameter of mainstream bonding wires is in the range of 15 to 25 µm, which is one-third that of human hair, for which diameters range from 70 to 100 µm. These wires feature well-balanced performance in terms of conductivity, thermal conductivity, corrosion resistance, stability, and processability. We offer high, middle, and low loop types to match your required wire bonding loop height. Our product lineup includes wires with distinctive characteristics for each loop type. The best product to reduce costs. The problems associated with copper, such as easy oxidation, poor durability and adhesion, however, these have been solved with improved surface treatment and processing technology. This product reduces costs approximately 90% compared to that of gold wires. In addition to wires made only of copper, the lineup includes the X-wire and CLR-1 series, which feature precious metal coatings to improve durability. Silver is known to have the highest conductivity and thermal conductivity of all metals. Although silver materials are less expensive than gold materials, silver easily become sulfurized and had a problem in durability. Tanaka Denshi Kogyo K.K. has solved these problems and is successfully marketing the results as commercial products. Customers can reduce material costs by about 80% compared with gold and use any equipment they already possess for handling gold wires as is. Silver wires have a bonding speed nearly equivalent to gold wires. We used aluminum, which has excellent conductivity and durability as well as a low material cost, as a bonding material. Aluminum bonding wires, which have excellent bondability and corrosion resistance, can be formed into wires with diameters in the range of 100 to 600 µm or ribbons of widths in the range of 0.5 to 2.5 mm. Such wires can even conduct electricity, thereby allowing them to play an important role in power device applications. We also offer aluminum silicon wires, in which silicon is mixed in to improve the strength of the wires and make them thinner. 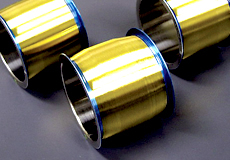 In addition to the above products, we also manufacture gold and gold alloy bumping wire products. Since its establishment in 1961, Tanaka Denshi Kogyo K.K. has maintained the leading market share in the manufacturing and development of various bonding wires. Combining experience and skills, Tanaka Precious Metals Group will continue to provide new products to meet the customers' needs. To listen to our customers' voices, we visit our customers' development sites where our products are actually used even after product delivery. Based on the information we obtain from customers through interviews as well as from our vast experience and long-established track record, we suggest the products best suited to each customer's demands by developing new materials and suggesting how best to use them. Tanaka's wide range of high performance and high quality bonding wire products are recognized throughout the world. Tanaka Precious Metals Group has its primary development and manufacturing base in Saga Prefecture and another in Japan as well as four additional bases overseas, including locations in Hangzhou, China and Singapore. Case Study:Use of copper bonding wire reduces material costs by 90% to resolve the issue of steeply rising gold prices impacting profits. Case Study:With just a small capital investment, material costs can be reduced by 80%. Silver bonding wire exhibits excellent durability, conductivity and speed of production.